Kombucha is a sweetened, fermented tea. Don’t be afraid of the picture! Okay I admit, it IS a little scary looking. When I started making it at home, anyone who came over would be just a smidge creeped out at my “jelly fish” or “alien” in a jar of liquid haha. But really- nothing to fear. The jelly looking part on top is the “SCOBY” (Symbiotic Colony of Yeast and Bacteria). 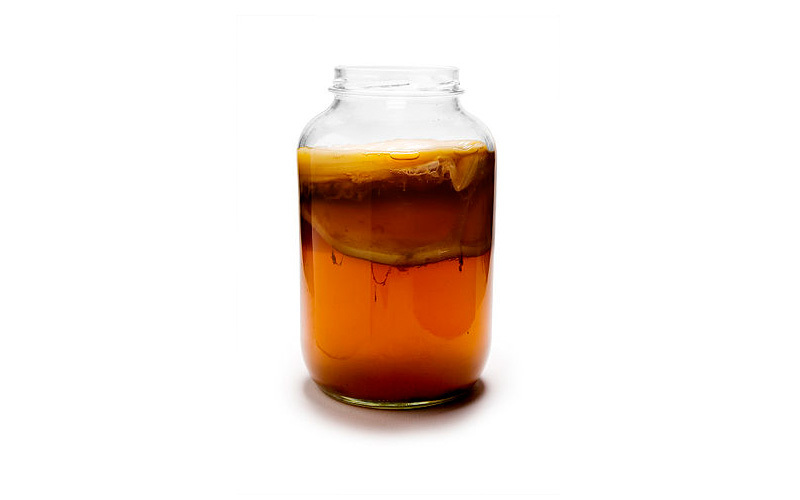 You brew the sweetened tea with the Scoby, which eats the sugar until about 90% of it is gone. This creates an acidic drink that is rich in vitamins, enzymes and probiotics. Our hyper-sanitized culture is disrupting our internal “microbiome” – the balance of good and bad bacteria living in our gut. Everything from taking anti-biotics to drinking chlorinated water is killing off these incredibly important bacteria which then contributes to mental illness, IBS, food sensitivities, candida overgrowth, a depressed immune system and a host of other issues. So, how do we replace these good bacteria? By eating fermented food! This isn’t anything new, by the way. Almost every traditional culture has some type of fermented food they’ve been eating for years and years. Liver detoxification, improved mental health, increased energy and better digestion are just some of the benefits of consuming Kombucha. 4 quarts of brewed sweetened tea (ratio is 1 cup of sugar per 4 quarts of tea) Black or Green teas work best. Use unbleached, organic cane sugar if possible, but regular granulated sugar works too. Prepare your tea and let it cool down to room temperature. If the tea is too hot it can kill your SCOBY. Pour tea into jar leaving a few inches of room at the top. Gently place the SCOBY on top of the liquid. It should float, but if it doesn’t just let it sink. It should start to float in a couple days. Cover jar with the coffee filter and wrap elastic band around it tightly. It will attract flies like crazy so make sure it stays sealed! Leave for about 5-10 days in a warm area of your house (around 21-26 degrees C). The length of time it takes will depend on the temperature. As it heats up in Kelowna it will be ready much faster. You can give the tea a taste- it should be tart and a little sweet! If you want to make the tea fizzy it will need a second ferment (see below). If not, just pour into glass jars with airtight lids and put in the fridge. Pour any type of fruit juice (except citrus) into jars, filling about 1/5 full. I’ve also used frozen berries instead of juice and it’s turned out delicious! Add Kombucha tea, leaving about an inch of space at the top. Seal with airtight lids and leave for another 2-7 days at room temperate until carbonated. NOTE: start with a few sips at a time- if you have an overgrowth of bad bacteria, it may make your stomach a bit upset. Don’t worry, this is very mild and a good sign.